Like boomerangs, some bad ideas keep coming back. Space-based missile defence has been pursued intermittently by the United States since the launch of the Space Age. Now, under Donald Trump, America is once again dreaming that it can protect itself from nuclear-armed missiles by deploying a “shield” of interceptors in outer space. Closely resembling President Reagan’s derided “Star Wars,” this shield—we are told—is finally doable. But even if the technical problems have now been solved (and that’s a big if), enduring problems linked to cost, efficacy, geostrategic stability, and morality remain. The United States has been interested in ballistic missile defence (BMD) since the Second World War. But, so far, no successful BMD system has been launched. Why? Because shooting missiles out of the air is hard. A ballistic missile is a rocket that delivers a warhead by following a ballistic trajectory from one point on Earth to another. BMD systems are designed to intercept these missiles during one of three phases of flight: the boost phase shortly after launch, the longer midcourse phase as the missile travels along its trajectory through space, or the terminal phase of less than a minute when the missile’s warhead reenters the atmosphere and accelerates toward its target. The easiest point at which to intercept long-range or intercontinental ballistic missiles designed to carry nuclear warheads is during the relatively long midcourse phase, lasting up to 20 minutes. 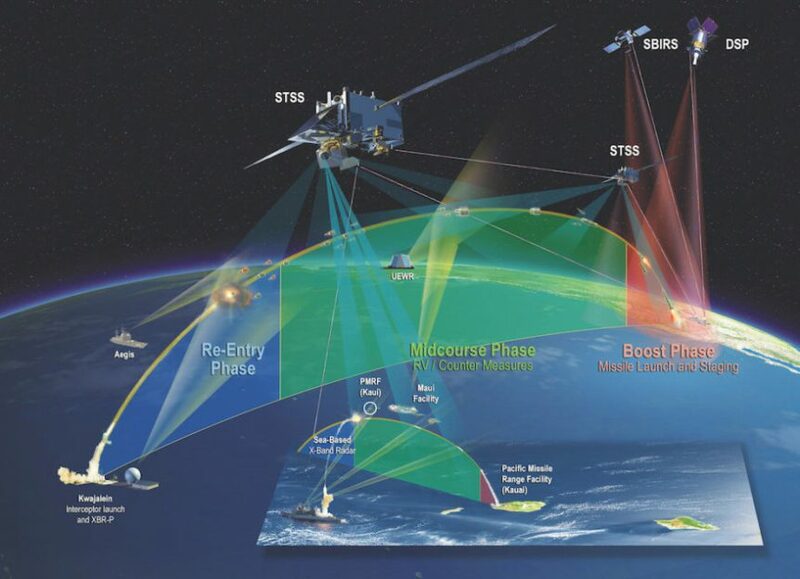 This is the objective of both the Ground-based Midcourse Defense (GMD) system and the sea-based Aegis system. But even during this stable stage of flight, interception is challenging. Tracking the warhead, which separates from the missile near the end of this stage, is tricky and it’s never easy to hit a bullet with a bullet. When the defence system must also determine the real missile from decoys, a successful intercept is far from guaranteed. Despite the estimated $200-billion spent on BMD since 1985, these two systems have limited capabilities. Current BMD can defend against only a small number of incoming missiles that use only basic decoy methods—not a representation of “real-world” conditions. And even under ideal test conditions, the success rate is poor. Although President Trump boasts that U.S. missile defences work 97 per cent of the time, Laura Grego of the Union of Concerned Scientists asserts that the GMD system has only intercepted its target on four out of 10 tests since 2004, and that the rate of failure has increased over time. But the dream lives on. Immense sums of money are being consumed to build more sophisticated interceptors. Recently, the desire to add a layer of boost-phase defence has been resurrected. Boost phase provides the ideal opportunity for interception because the missile and warhead are still joined, are moving relatively slowly, and are easily visible to radar. But this phase lasts, at most, three or four minutes. To hit its target, an interceptor must be launched quickly and from a nearby location. The best chance for success is to strike from outer space. Almost from the beginning, plans for BMD have included orbiting interceptors in space. The 1960 BAMBI (Ballistic Missile Boost Intercept) program was conceived as an orbiting swarm of interceptors or mines with nuclear warheads, capable of intercepting an enemy missile during boost phase. Cost and moral opposition to orbiting nuclear weapons above Earth (later banned by the Outer Space Treaty) killed the project. The idea of space-based missile defence was reborn under President Reagan, who pitched it as a way to “free the world from the threat of nuclear war” by making nuclear weapons “impotent and obsolete.” In 1983, the Strategic Defense Initiative (SDI) was announced to pursue research into weapons programs for both ground- and space-based missile defence. Popularly known as “Star Wars,” it continued work from the 1970s that aimed to destroy incoming ballistic missiles with nuclear-powered X-ray lasers or with pellets from a nuclear shotgun. From these failed ideas, “Brilliant Pebbles” was born. Emerging as the focus of SDI, it was intended to create a constellation of conventional, kinetic hit-to-kill interceptors in low Earth orbit. With the Cold War winding down, Star Wars was officially cancelled in 1993. Extraordinarily expensive, it remained plagued with technological challenges, inherent defensive limitations, and physical vulnerabilities. Opponents also objected to the geostrategic implications of violating the Anti-Ballistic Missile Treaty and a renewed nuclear arms race, while the Soviet Union, in particular, feared its dual-use offensive capabilities as a space weapon. The 2017 U.S. National Security Strategy called for boost-phase missile defence, with space-based interceptors one of the few options. The 2018 U.S. National Defense Authorization Act (NDAA) requires the Missile Defense Agency (MDA) of the U.S. Department of Defense to establish a testbed to conduct research for rapid development of a space-based component of BMD that includes kinetic interceptors and directed energy platforms. In the 2019 NDAA, signed in July, the MDA is instructed to design an orbital shield, initially using a constellation of kinetic interceptors, while exploring the use of high-powered lasers on satellites, which remain a dim possibility decades after research was first initiated. Michael Griffin, U.S. undersecretary of defence for research and engineering, has asserted that this time “effectivity is beyond doubt; it’s not technically hard to do.” But feasibility is not the same as efficacy. To be close enough to intercept a missile during its short boost phase, space-based interceptors must be in orbits close to Earth. Because satellites in low orbits are in constant movement around the Earth, providing coverage for even a limited geographic area, such as North Korea or Iran, would require several hundred armed satellites. Griffin has pegged the cost for 1,000 interceptors at $20-billion. Grego argues that this represents only the launch costs for the interceptors. Additional extensive funding will be needed to research and build the interceptors, sensors, and ground stations to operate the satellites; replenish the spacecraft; and operate the system. A more realistic estimate: more than $300-billion. And even then, the system would continue to face technical limitations. Griffin has acknowledged that BMD is not capable of responding to emerging threats posed by hypersonic missiles. Griffin’s assessment also ignores the strategic costs associated with BMD. Although there are no current legal prohibitions against the deployment of space-based interceptors, as in the past, it is certain that Russia and China would strenuously object and respond by launching similar systems, building up nuclear warheads and delivery systems, or accelerating the development of antisatellite weapons. The result would be an arms race in space. The BMD dream is really a nightmare. Not only does BMD not work, it’s inherently dangerous. It ups the odds of nuclear confrontation. It weaponizes outer space, a domain now essential for almost all human activities on Earth. In 2005, Canada decided not to join the United States in pursuing the current iteration of BMD for reasons that include wanting to preserve a weapons-free space environment. Project Ploughshares took on the direction of the Space Security Index project for the same reason. The cost is just too high and the defensive benefits illusory. The only way to free the world from the scourge of nuclear weapons is through disarmament. Paul Esau is a doctoral student in History at Wilfrid Laurier University in Waterloo, Ontario.